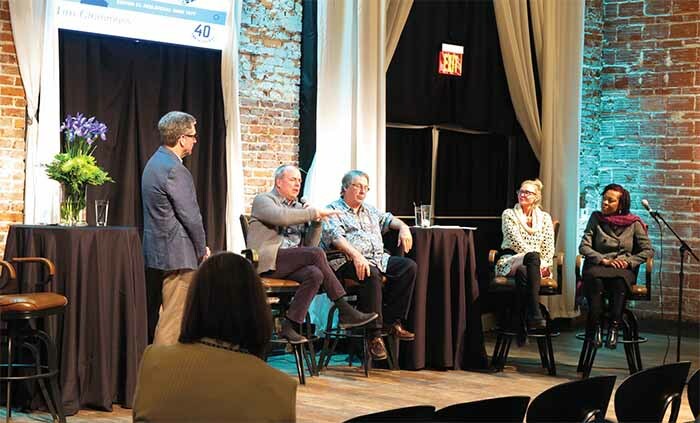 It was a beautiful evening at Nova 535, an historic event space on 9th Avenue North, as Preserve the ’Burg celebrated its 40th anniversary this past January with a party and panel discussion featuring local experts talking about the organization’s accomplishments, as well as the direction for the future. While initially Preserve the ’Burg counted just a handful of preservation activists, today the organization has over 1,000 members. “We are lucky to have a group that educates people to the city, curates and looks out for the city, and finds those jewels that are all around us,” Mayor Rick Kriseman said in his opening remarks at the 40th anniversary celebration. One of the earliest examples of public support for saving the city’s historic buildings took place in 1977, when a few citizens picketed against the demolition of the 1913 American Bank and Trust Company. Unfortunately, only two columns were saved. They’re now a part of the Veterans Memorial in Williams Park. But, the event ushered in a new era of interest in preservation. Two years later, Francis McSwain Pruitt successfully launched a dramatic effort to save the historic 1901 Veillard House. Henry Dupont – of Don Cesar Hotel fame – designed this unique masonry bungalow and Queen Anne style structure. Pruitt purchased the home and moved it two blocks down to its present location at the corner of 3rd Street N and 4th Avenue N, where it still stands today. The home was listed on the National Register of Historic Places in 1982. It’s interesting to note that Ralph Veillard – the original owner of the Veillard House, and a member of City Council in 1908 – wrote the resolution of city’s intention to purchase the entire downtown waterfront, preventing its development by private investors, and thereby preserving it for all the public to enjoy. “If we didn’t have the waterfront parkland, we wouldn’t be what we are today,” says Natalie Pruitt Judge, one of the panelists at the 40th anniversary celebration and the daughter of Francis McSwain Pruitt. More recently, Preserve the ’Burg has been instrumental in helping residents in the Old Northeast apply for historic district designation for select ‘enclaves’ of homes within the district. According to Emily Elwyn, Preserve the ’Burg’s president and an Old Northeast resident, one of the organization’s goals for 2018 is to work with property owners interested in having their neighborhood become an historic district. Preserve the ’Burg has a special fund to pay for district applications. Two historic designations have been approved and a third is pending. In November, the city approved 14 properties in the 200 block of 10th Avenue NE between Bay and Oak Streets. These homes were developed between 1915 and 1936 in a range of architectural styles. Last March, 10 properties in the 700 block of 18th Avenue NE between Elm and Walnut Streets were approved. 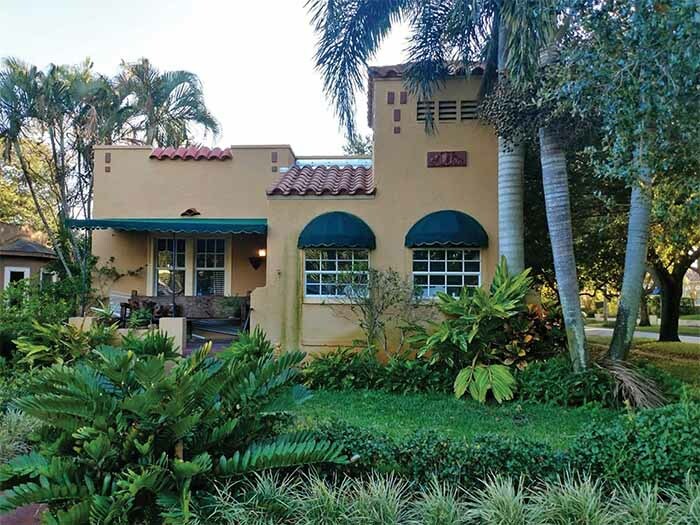 These homes date back to the 1920s boom when the city’s wealthier residents – many of whom were recent northern transplants – were prompted to purchase homes in the North Shore section because of its reputation as the premier residential section in one of Florida’s up-and-coming communities. Still pending is a section of 10 homes on the south of 19th Avenue NE between Bay and First Streets. Designated as Welch’s Mediterranean Row, the homes were designed by C. Sedgwick Moss and constructed in 1924 and 1925 by contractor M.B. Welch. 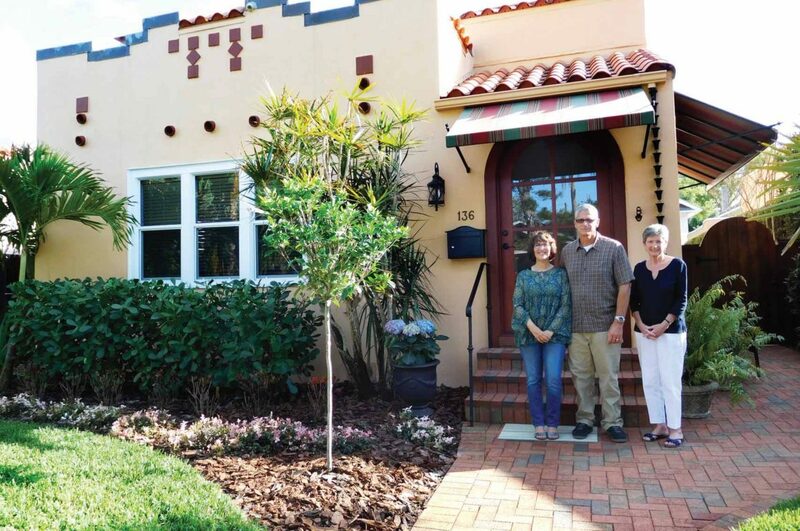 Guy Keirn and Dr. Susie Wehr feel fortunate to live in one of the distinctive homes in Welch’s Mediterranean Row. “Nowhere else in the US are there 10 Mediterranean Row homes in a single block like this. We feel that we are the stewards for these houses,” says Keirn. Welch’s Mediterranean Row homes were designed by C. Sedgwick Moss. Over the years, Preserve the ’Burg has counted both success stories and lost opportunities to save historic buildings from demolition. As panelist Dr. Ray Arsenault, a professor at the University of South Florida St. Petersburg, pointed out, one of the biggest losses was the 1924 Soreno Hotel, St. Pete’s first ‘million-dollar’ hotel. In the late 1980s, when downtown was struggling, the hotel was demolished as part of a scene in the movie Lethal Weapon 3. “That episode changed everything for us. It was a David and Goliath moment,” says Dr. Arsenault. The Soreno became a rallying cry for preservation. 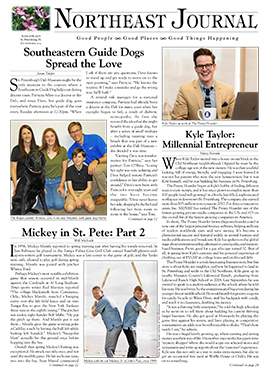 Tim Clemmons, principal of Mesh Architecture, highlighted Preserve the ’Burg’s efforts to create a Downtown St. Petersburg Historic District, which was approved in 2004. 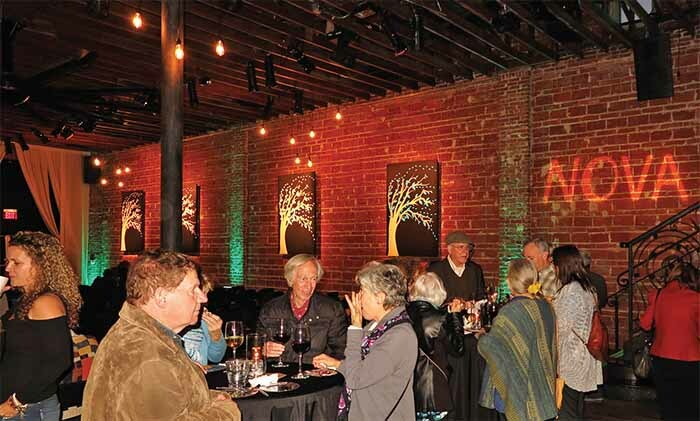 “We may be only 110 years old, but the city has a rich collection of historic buildings downtown,” says Clemmons. He shared some of the interesting comments the group received during the application process when reviewers noted the eclectic nature of downtown buildings dating from the 1880s through the 1950s; and the city’s history as a recreation, leisure, and tourist town, with the Shuffleboard Court, Lawn Bowling, and Chess Clubs as prime examples from that era. Sharon Winters moved to the Old Northeast from Tacoma, WA, two-and-a half years ago and was among local residents attending the event. 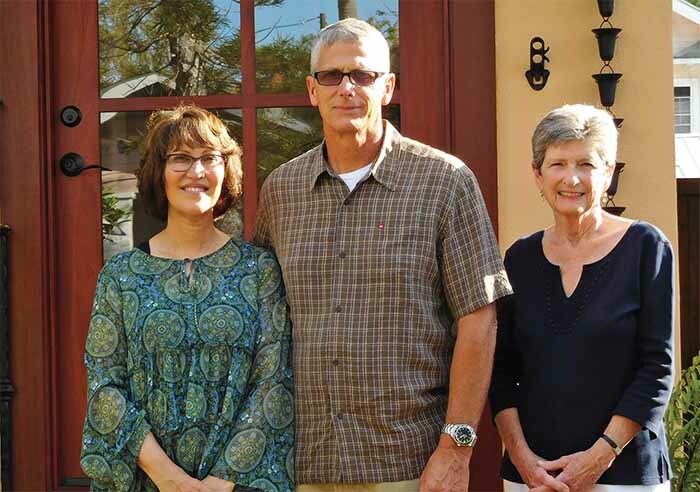 She and her husband love the character of the city, the historic buildings, the waterfront, and walkable neighborhood. “We find there is community wherever you go, but there is a real unique sense of place here,” says Winters. Her favorite building is the open-air post office, which she describes as ‘quintessential Florida.’ Her husband was sold on the city’s bike co-op program and overall lifestyle and culture.